Interbike is the big annual bicycle expo in Las Vegas, Nevada. 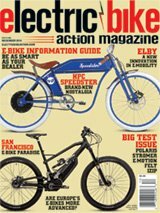 We are here right now checking out the latest stuff, talking about the trends, and discussing the industry with manufacturers and dealers to find out what’s going on in the world of electric bikes. We’ll have more comprehensive coverage soon, but here are highlights from the first day of Interbike and some images from the Outdoor Demo, an event that happens during the two days prior to Interbike. Registered participants can come in and take demo rides on hundreds of bike and check out some of the latest gear at the venue in Boulder City, Nevada. We set up the “Shootout at E Mountain” with the organizers of Interbike to offer retailers to ride any of over a dozen different electric mountain bikes to compare handling, motors and more on a specially designed course. We have a lot of great feedback from that on what people liked and what they thought could be improved. Nearly every manufacturer here had a new mountain bike. When the Interbike show started, the crowds rushed in. Yamaha debuted a whole line of electric bikes, from mountain to road to commuter at the show, featuring the new PW-X motor. We liked the PW-X motor enough to elect it as the Interbike Component of the Year. This year, there was some tough competition. Editor Tony Donaldson presented the award. Chad and Lance from Hi-Power Cycles are demoing some more normal bikes than the ones they’re used to. They still wouldn’t miss a chance to celebrate Wheelie Wednesday when they saw our lens. What’s cooler than a Bosch-powered Kona mountain bike? A Bosch-powered Kona mountain bike with a Bosch-powered chainsaw mounted on it to assist in trail building! Raleigh’s new carbon Tokul. The specs haven’t even been finalized, so this is definitely a first look!